A patent application from Apple entitled "Active Electronic Media Packaging" has been discovered by Apple Insider. The patent is for an active packaging system that would send power and content to a device that is sealed in its packaging and on display in a store, so that it can show off features and display content to prospective buyers. The idea is to eliminate labels and other forms of advertising that is placed on a device and let the product sell itself. 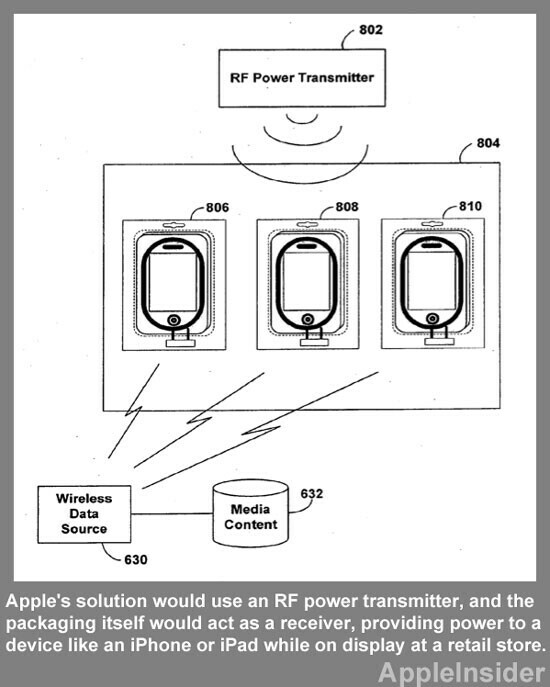 Because most packages do not offer a way to externally charge the device inside, Apple's plan is to use an RF power transmitter to send power to the packaging, which might also double as a receiver. This eliminates the need to physically connect a power supply to each display. And by sending the power to the packaging, it means that there is no need to have the device itself recharge without a wire. This means that no additional technology would have to be built into the device which would increase its size. The packaging would also allow the device to receive firmware updates while in the store, still sealed inside the packaging. 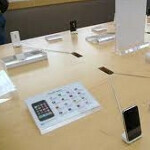 The patent was filed last December by Apple's new technologies manager Michael Rosenblatt. Rosenblatt's group filed 42 patents related to the Apple iPhone and Apple iPad over a period of two years. Haha wow only Apple would have this kind of patent. Looks like they are just patenting random things. This isn't even feasible. Keep the downvotes coming. I know more about RF than most of you will ever hope to, this is my lifeblood. The reason(s) as to why it not feasible are numerous, and there are other wireless power transfer application better suited for this particular scenario. But I'm just an internet commenter like you, except I work in direct support DoD USAF for a major Defense contractor. I don't expect you to take my word on it, just go do some research. Disclaimer: I have no vested interest towards any cellular companies, the above was not a baseless fanboy shot at Apple. I use whatever phone has the best hardware, OS/brand is irrelevant to me. That's silly. You should know best hardware doesn't nessecerily mean best performance. Hardware is only as good a the software pushing it. I wouldn't say its useless. In fact, I think its a pretty cool idea... Apple is still the biggest troll, that is very much true. Well in theory it could work, but this type of wireless energy transfer is still in it's infancy and a very long ways off. Perhaps they are just planning way ahead. Well yeah, that's the idea. If the patent goes through it will force other companies to either license the tech or find a different way of achieving the same thing. Either way, they're hindering other companies from accomplishing similar methods of sale. But yeah, of course it's too expensive and incomplete to impliment today. Apple is securing the future. "The idea is to eliminate labels and other forms of advertising that is placed on a device and let the product sell itself." Noooooo, the idea is to eliminate salespeople. God dam apple, they sure do not like to pay their employees eh? Plus, most iPeople can barely make a call or even do basic operations on their devices, this...this won't end well. Are you stupid? Serious question, not trying to be a jerk, I honestly believe you may be stupid to make such a, well. stupid statement. Why else would apple do it other than to eliminate employees? Just to be "nice"? As such as i love wireless charge technology, as now that technology still 5 to 10years away and Apple already want to patent. On theory it should work, will it work in real life is diffirent story. Apple applies for a patent that allows your device to flush your toliet for you. Wasn't there another company already doing this? The wireless charging, data transfer, the whole nine? This just sounds very familiar. @whateverman just like how they werent the first one to have slide to unlock yet were instantly granted it despite having no research done. I think its pretty ridiculous that apple wants to save a buck on advertising at the expense of months worth the wear and tear on your device before you even open the box... Why on earth would anyone want to buy a phone that has been running non stop, with the screen on(probably max brightness because thats the default) for 40+ days on the store shelf.... No thank you, why not just buy a display model/open box/refurbished iphone... Its the same thing right? Maybe I'm wrong? Now all Apple needs is a device that manufactures itself patent and they can just site there and collect the checks.